Need a creativity boost? 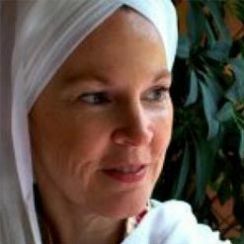 Try Yogi Bhajan’s inspiring meditation practice. A powerful way to tap into the authentic inspiration and boundless creativity potential is to invoke your higher Self. The following meditation, which Yogi Bhajan taught students, can help you sharpen concentration, access intuition, and enhance creativity. Begin by sitting in any meditation pose, with your eyes focusing on the tip of your nose. Lift your chest and elongate the spine. Lift the crown of the head as your chin relaxes down and in. Let the shoulder blades relax down the back. Guru refers to wisdom or teacher, and dev refers to the subtle or divine. Create a connection to the sacred wisdom within by chanting Ong namo guru dev namo three times. This chant calls on the creative consciousness and the subtle intelligence of the entire universe. Ong is similar to Om—the vibrational sound of the universe—but in its active, creative form. While Om is beyond time and space, Ong connects us to the creative energy embodied in this moment. Namo means “to acknowledge or call on respectfully.” Guru refers to wisdom or teacher, and dev refers to the subtle or divine. Next, bring your awareness to the breath and silently repeat the syllables sa ta na ma, the sacred mantras signifying infinity, birth, death, and rebirth–the cycle of creation. Continue for 11 to 62 minutes. When you feel complete, inhale and retain the breath only for as long as it is comfortable. Exhale and continue to breathe naturally. Take a moment to say a prayer or set an intention for your creative endeavors. To close, chant sat nam (which means “I am truth”) three times.